I'm up early as ever and I decide the best thing to do is go to the small Tesco in Ullapool. For breakfast I get some pain-au-chocolats and "just add hot water" porridge packets. For lunch I grab a triangle sandwich and for tea I think some baps will go well with the tin of soup I already have with me. Ullapool is a small town with a population of around 1,500 according to Wikipedia. It feels bigger, not physically but in the sense that it has a Tesco, various shops, a large port and a petrol station. As I walk around I ponder this, coming to the conclusion it's isolation requires it to be very much self sufficient. I do love this town, I feel at ease as I walk around the estate and the sea wall in the peaceful morning air. 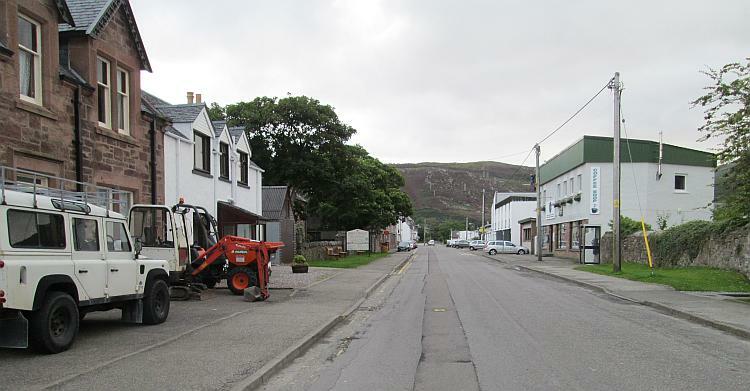 Just an ordinary street in Ullapool. The backdrop is dramatic. This...this might seem rude but I'm hoping Mark will head out with his mates today. Several ride outs are planned among the various attendees and I don't think I belong with any of them. They're all on larger capacity machines and it seems they all have big miles and big speeds planned. Me? I want to explore and I want to do it at my own pace and in my own style. If Mark joins me I'll have to consider his desires and hopes. He's never been demanding or difficult it's just that today I want to be completely self indulgent and totally selfish, the only way to do that without bothering anyone is to do it alone. Mark is off with his pals and I am invited. I decline and I also make a point of not asking about the other rideouts. I am being antisocial and I know it but today is all about me and as long as I'm not causing anyone else any heartache then that's fine. I've been trawling my maps and there's a peninsula just a handful of miles up the coast with a collection of small villages and that's about it. That sounds ideal. The skies are presently filled with light cloud and the forecast suggests a risk of rain but mostly dry. This could be a good day. 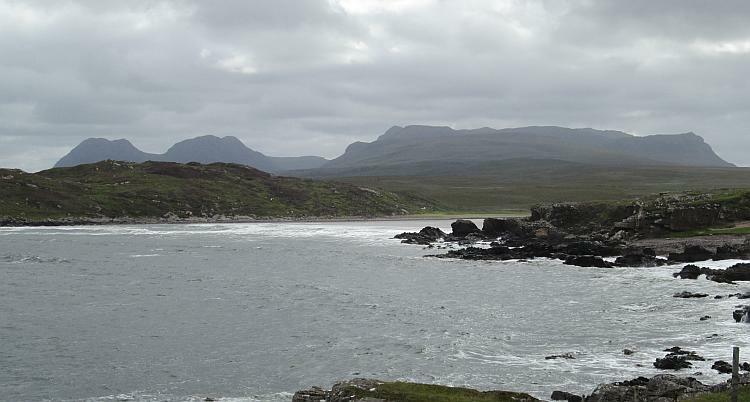 The Achiltibuie Peninsula north of Ullapool. Courtesy of OpenStreetMap.org. 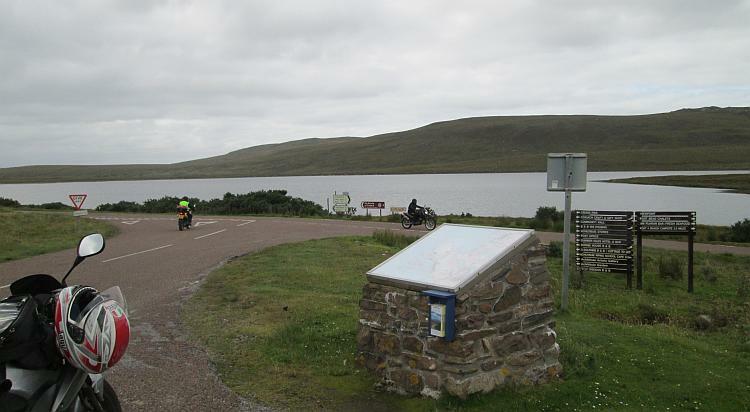 10 Miles north of Ullapool I find the turning and take a left towards Achiltibuei. Here I come off the two lane main road, that is still very quiet, onto single track with only the occasional car passing by to remind me that I am not entirely alone. I slow down. I slow to the speed I love to explore at, 20 or so miles per hour. You can't do this on a busy main road because you risk at best being harassed by cars and lorries trying to get places, at worst being rear-ended because it's just not normal to travel this slowly on a motorcycle. I take a long deep breath and relax. Perfect. I am pottering along at my genteel pace and this gives me the time to see that which is around me. There are broad swathes of land covered in hardy grasses and thistles, water in the form of small boggy marshes through to the larger Loch Lurgainn and craggy hills and mountains jut out of every horizon. If it weren't for the slab of patched tarmac that I ride along I could feel as though mankind never existed. I know in my heart this is a nonsense, even here there are sheep and several millennia of habitation will have changed the landscape but it FEELS primeval and unexplored. Am I alone? To be here riding along this quiet empty lane at 20 mph is perfect and peaceful. My illusions are shattered as I pass a cyclist pedalling hard into the stiff headwind. There's a touch of dampness in the air and I am cold. It is much more exposed and bleak up here and I think I shall find somewhere to stop and put my waterproofs on. I pull in by a tourist plaque that explains where I am and the distant beach. A tourist plaque. Damn. That really has kiboshed any sense of being the wild adventurer hasn't it. Oh well. I am not alone. however it remains peaceful even when I am passed by 2 other riders. We are back in civilisation, such as it is around here. Small clumps of low built houses can be seen here and there, when I pass them by they are in fair condition but all seem devoid of life right now. I head to Achnahaird Beach down a narrow gravelly road. Being the great explorer that I am I join 2 campervans and 2 cars at the end of the lane, again they all seem empty and lifeless, it's as though the people have been taken by aliens. They're probably all out walking. Achnahaird Beach is inaccessible to vehicles which seems to have kept it pristine and magnificent in all it's remote glory. This also looks like a perfect beach for body-boarding as the waves wash up onto the sandy shore between the rocks. Achnahaird-Beach. Stunning, I hope it's remote location stop it being "discovered". 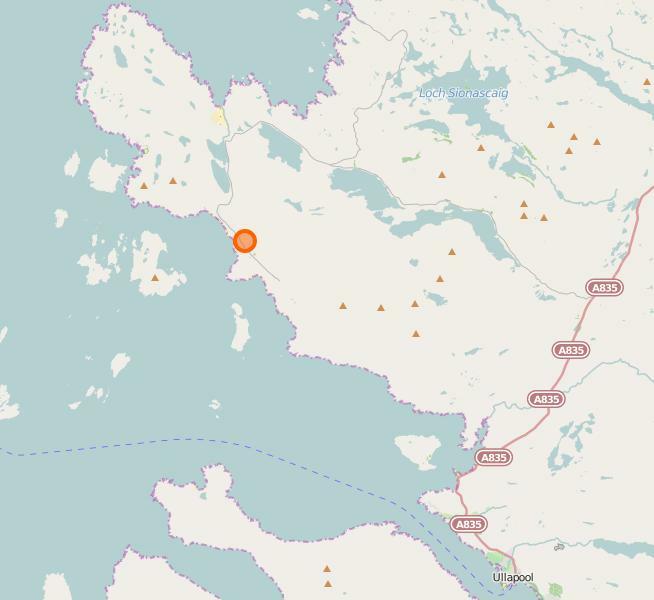 I head north to Reiff, Altandhu then Polbain. While their names are upon the maps they are not villages, they're hardly even hamlets. They are a handful of white painted houses in visible proximity to each other and no more. 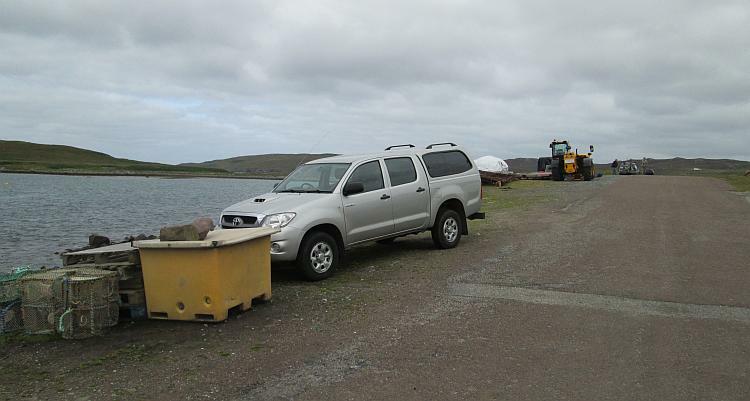 There's a jetty here, a rusty container there, some signs of fishing in places and the occasional pickup truck. Out on the water lie small boats and trawlers, moored up yet like everywhere else there are no people. Either my timing is off and this is the Highland siesta hour or someone's not telling me something. Eventually a car passes in the opposite direction and the lady within nods a smile and thank you for letting her pass by. I am not alone. Gosh the traffic near Polbain is crazy! Still no actually living people here. I follow the coast road south towards Achiltibuei and soon I am in the sprawling metropolis. It's busy here as there's a builder moving some materials around and AND another car is coming towards me, it's positively heaving. There's a letter box, a tiny school with no children on show and even an old red phone box. A little further down and I spot a sign for "The Piping School Cafe". Aha! time for tea I think. The Piping School? Do they teach plumbing? Will the tea be piping hot? It takes a moment to realise it's probably got something to do with bag pipes. Nope. 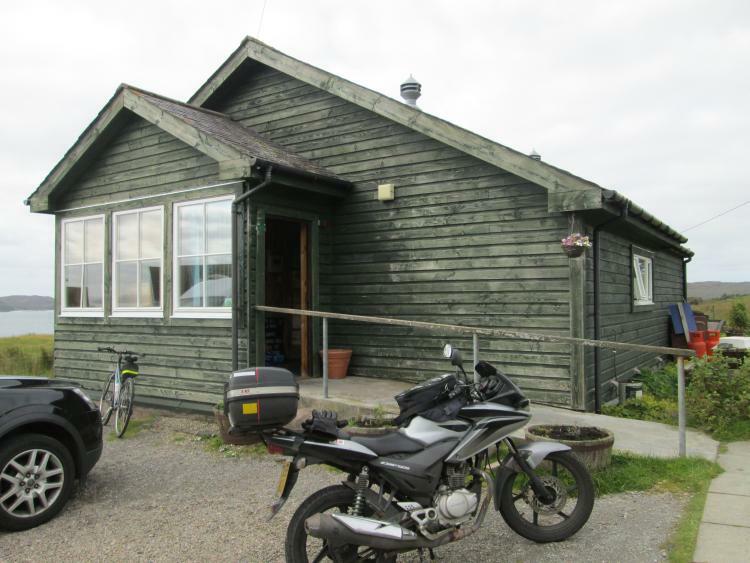 All I find is a small wooden building and within it has the air of a remote community centre. I walk down a narrow corridor and into a comfortable room on the side of the building where one of three ladies furnishes me with hot tea. Again I am not alone, a couple of walking types sit at one end and 4 ladies talk with Scottish accents around a table. I like it here, sipping tea while looking out over the bay. I am as calm and relaxed as this area feels with no sense of rush and no urgency to be elsewhere. It's a strange feeling. The Piping School. And not a plumber in sight. Chilled out. One of the walkers engages the ladies to talk about Scotland's independence referendum. Oh dear. The conversation starts out pleasantly enough then he becomes insistent with his thoughts of unity. It is clear these 4 ladies all have different thoughts about the matter yet they all rubbed along merrily, the walker is causing them to become polarised. It is at this point before the peace is shattered I beat a hasty retreat and pay my bill. No matter how far, no matter how peaceful and pleasant, it only takes a strong opinion to ruin any idyllic situation. I follow the road south once more through 2 more tiny clusters of houses then pass the sign for Culnacraig. Culnacraig is at the end of the road and comprises of just one solitary house, as far as I can see. Imagine that. This town, no I mean village, no I mean hamlet, no...house is featured on the map! 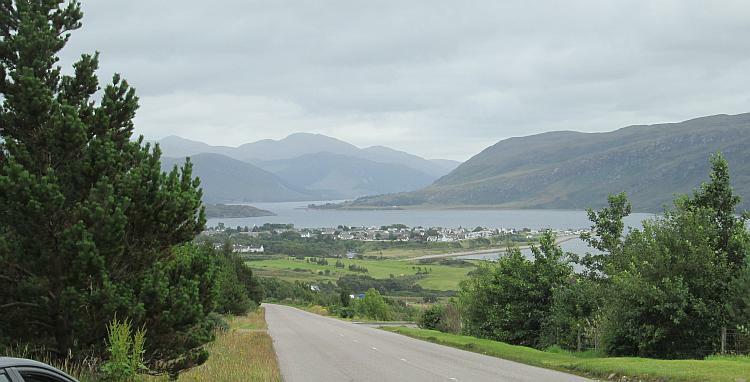 I turn around and head north once more and back towards the main road for Ullapool. It amazes me how going in the opposite direction reveals new views, fresh features and a whole new aspect of the same road I have just ridden. At one point I have to check my map to make sure I've not taken a wrong turn. I can't have done, there aren't any other roads than the one that I am on. Ooooh, another car. The bustling chaos of Culnacraig. I wonder if there's a shop? By the time I return to the campsite I calculate I have done 75 miles in the last 6 hours. I feel as though I have properly looked around the Achiltibuei area rather than skimmed by it. This is how I want to travel. I want to see the places, talk to the people, sit and savour the ambience. I don't want to visit the must see museum or eat at the renowned restaurant. I want to look down the back alleys and behind the workshops. I don't want to marvel at the impressive architecture I want to gain insight how the people live. I do wonder what the residents of that area do? There's plenty of signs that fishing is important although it lacks that industrial scale of Mallaig. I'm sure tourism plays its part too but it is a different world entirely to that of Blackpool or even Whitby. While Ullapool is not a big town perhaps a few of them commute there for work, I imagine that could be quite precarious in the depths of winter. Some may be retired but there's no medical assistance nearby. Maybe some of the houses are holiday homes. I don't know for sure and I don't know how to find out either. I have been allowing myself just a touch of self pride at the rally for being the only idiot to make the trip on a small capacity motorcycle. 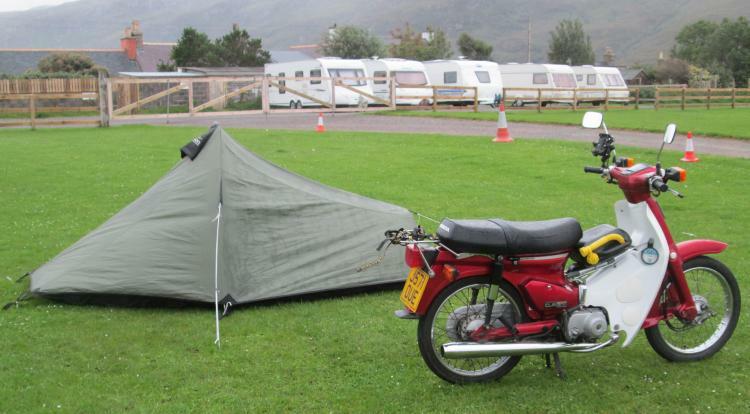 Imagine my disappointment then when I see a Honda C90 arrive, complete with luggage. Damn! Yeah, but I bet he's only come from Inverness. Nope. He's from Blackpool. DAMN! Not only that but he's made the trip over 2 days and taken a longer route than I did. HOT DAMN! I bet he's younger than me. Nope. Right - that's it - I am purchasing a Chinese rev-n-rip 50cc moped on my return and I'm going to ride it to next years Ullapool rally via Cornwall and Kent. In one DAY! Pfffffft. ARGH! A blinking C90 - OK, OK, you win fella. Grrrrr. Actually he's a lovely chap and we both share the same masochistic challenge of riding small bikes to far off places. We also both agree that it's not without its downsides and problems either. I spend an hour talking to various people at the rally and we all share our tales, our tips and our desires. It surprises me how many character types there are. Retired wealthy businessmen trying to avoid being bored to death, young adventurers with so much energy, middle aged blokes like me trying desperately not to let the years catch us up and regular folk who simply enjoy a weekend away. We are all sorts but we mostly share a desire to look around, be it near or far. I spend the rest of the evening with Mark and his mates again. They too have had a good ride and covered 140 miles through some of the remotest parts of the UK. Thankfully they're an easy going group and the conversation comes and goes into subjects like bikes, work, wives, places we've been too and places we'd like to go to. Of course there is the teasing regarding what bikes we choose to ride and of course just how warm and comfortable the hotel rooms are. As I shuffle into my sleeping bag I do appreciate it would be nice to be inside the hotel, but then I'd have no money left for any more trips. It's a balance thing isn't it. But what a day it has been. How lucky was I to get to see the Achiltibuei area in all it's glory. How relaxing was it to ride slowly and gracefully through somewhere that contrasts so much to my home town. And how good is it that I was on the perfect motorcycle for that task. 1200cc, quarter ton, 150 mph motorcycles don't do 20 mph, not as well as a 125 does. I remember seeing this view of Ullapool for the first time and falling for the town. Cheers Fraser. I did pass thr end of the road to Lochinver and considered going along it but time was marching on. I plan to return simply because I love the area. I am curious what the people of Achiltibuei and other such remote and tiny villages do for a living and for entertainment. It must be quite a different way of life to the one I live. Hi, I'm from Achiltibuie, Polbain actually. Brought up there, went to the local school etc. There's not much work and that's an issue in trying to keep people there. There's prawn fishing, fish farming, local hotel and couple pubs, some council related jobs, some small businesses, retired folk and tourism. Not much money to be made from the land and sheep. Lots of self catering houses. Was a great place to be brought up and myself and mates had DT50s, DT125s etc and scrambled all over the hills when we were young. No police so we rode from an early age! Cheers Andrew. Like most places there is good and bad I guess. You enjoyed such great freedoms that townsfolk can't even comprehend then correspondingly your options were limited. I do rather envy the idea of razzing around on old bikes and the only people to stop you were other locals.